HOUSTON, Texas, June 23, 2010 (ENS) – More oil is gushing into the Gulf of Mexico from the damaged Deepwater Horizon wellhead today due to a problem with the containment cap over the leaking pipe. One of the many remotely operated vehicles, ROVs, working near the wellhead bumped into a vent on the cap, closing it, explained U.S. Coast Guard Admiral Thad Allen, the national incident commander. “We had an incident earlier today where they noticed that there was some kind of a gas rising through the vent that carries the warm water down that prohibits hydrates from forming. Out of abundance of caution the Discover Enterprise removed the containment cap with the riser pipe and moved away until they could assess the condition,” the admiral told reporters on a teleconference briefing. 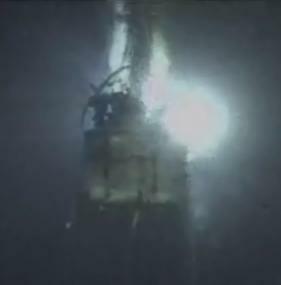 When the cap was removed for inspection, it released into the water the oil that was being diverted for collection to the ship Discoverer Enterprise at the surface. Some of the flow is still being routed to a second ship at the surface, the Q4000, where both oil and gas are being flared off at the rate of about 10,000 barrels a day. The latest flow rate estimates by a group of government and independent scientists puts the rate at between 35,000 and 60,000 barrels of oil per day coming out of the broken wellhead. “They will attempt to reinstall the containment cap and begin producing later on today,” said Admiral Allen. But if icy crystals called “gas hydrates” are found to be blocking the cap, “they will probably have to rerun the pipeline, and that will take a considerable amount [of time] longer,” said Admiral Allen. Allen said in the 24 hours ending at midnight a record 27,097 barrels of oil had been sent to the two vessels. In addition, regularly scheduled cleanup and response efforts may be impacted or halted as severe weather systems are expected to move across southeast Louisiana today, according to an annoucement from the National Incident Command, NIC, center at Houma, Louisiana. Scattered showers and thunderstorms are expected today as well as frequent lightening and wind gusts up to 40 miles per hour. “Crews will resume cleanups as soon as safely possible,” said the NIC.